Bioduken vibrerar när Jamaicas själ skärskådas i ett forsande och gripande tidsdokument bortom filmkonstens gränser. Filmaren Khalik Allah blundar inte för verkligheten när han ger liv åt sin mammas hemland Jamaica. Hans säregna blick fångar allt från profeter till prostituerade. Samtidigt som han laddar filmen med livsbejakande och sorgsna ansikten hörs röster och sånger som ger en inblick i öns turbulenta historia. Tillsammans skapar de en visuell bön, ett vackert kärleksbrev och en hjärtskärande sorgesång till den jamaicanska identiteten. Efter att ha varit fotograf på Beyoncés uppmärksammade Lemonade och regisserat debutfilmen Field Niggas bekräftar Khalik Allah sin position som en av vår tids mest spännande filmvisionärer. Seminarium: Khalik Allah - From Harlem to Jamaica, Tor 31 jan, 17.00-17.45, Festivalarenan. 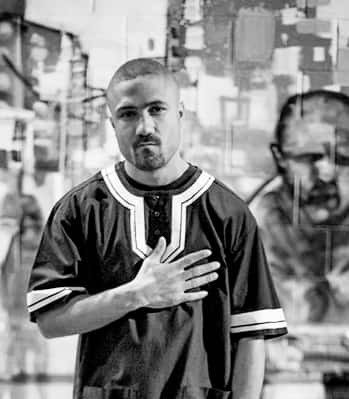 Khalik Allah, born 1985 in New York, is a New York based photographer and filmmaker who describes his work as Camera Ministry. A proclamation, a poem and a prayer punctuated by three trimesters; Black Mother is an audio-visual love letter to Jamaica. I shot my last film in the streets. I shot this one on a river. Everything in the film is connected through water; from the fruit to the land to the people, with a specific emphasis on the woman who carries life for nine months. There’s no container for this film, it overflows with intimate portraiture and prayers that are intended to hit you in the chest more than the head. A form of herbal remedy consisting of proclamations from Maroon warriors. A historical mirror shot on 16mm. Also Super 8, Hi-8 Tape, Mini DV and HD Video. An exercise in style and aesthetic to showcase my range as a photographer. A magnifier and mirror of modern day Jamaica reflecting its complicated history. A generous singular vision depicted through the lens of family and spirituality.